Gone are the days when we could rely on our memory to remember what we need to do at any given moment. Today, there’s no way we could recall for when exactly did we schedule that meeting four weeks ago, or whether our dentist appointment is coming up soon. That’s why we use calendar apps, which keep a perfect record of everything scheduled in our lives. There’s no shortage of Mac calendar apps out there, from the default option that comes pre-installed with the machine to other free alternatives to paid but full-featured third-party apps. Some are web-based, some are cross-platform, and some are also available on mobile. The problem is you really need just one best free calendar app for Mac. Not sure which one you should choose? Then this guide is for you. 1. Usability. Since you’ll be using your Mac calendar app multiple times a day, how it looks and how it behaves is critical. Notice how many clicks does it take for you to create a new event or whether all the information you need is clearly displayed and could be understood at a glance. 2. Features. When it comes to calendars, more is not always better. Some of the best calendar apps out there could be pretty bare in terms of functionality. And some of the most feature-packed ones are cumbersome to use. It’s all about what do you personally need to get out of the best calendar app for Mac. 3. Speed. No one likes to wait around, looking at the spinning circle. The best calendar apps allow you to add events quickly and ideally never freeze up on you. 4. Synchronization. We work in the multi-device world. The second you step out of the office, you expect to be updated on what’s coming next through your phone. Sometimes you use both laptop and desktop, and then your Mac calendar app is better to sync in time over a web server. 5. Integration. Every year, more and more automation helps us in our work. APIs are omnipresent. Already lots of people use Slack and IFTTT to get notified about any changes in any part of their digital lives. Plugging your calendar into the larger ecosystem is something to consider, even if it’s just a possibility at this point. There might be other aspects you’ve come to expect from the best calendar app for Mac. So your list might differ. The important idea here is to create a small framework that will aid you in comparing all the available options on the market. Now let’s break down some popular calendars and select the best ones. For the first contender to become the best free calendar app for Mac, why not consider the Calendar app you already have pre-installed? Mac Calendar app is straightforward and easy to use. The calendar itself is taking up most of the interface, and you can easily switch between different views using the tabs in the top bar. Creating new events is simple too: just double-click on any time in the day and fill out any of the fields. If a similar event has been created before, you can pick an auto-suggestion. Likewise, your event location will be automatically suggested by Apple Maps. You can also invite anyone to your event by email, even if they don’t use Calendar. For the event itself, you can choose one of many custom-created and color-coded calendars. Due to its simplicity, Calendar is a very speedy app. Built by Apple itself, it takes full advantage of having access to the whole sandboxed system, something not possible for third-party apps to do. Calendar comes pre-installed on all iPhones, making it easy to access on the go. A web version is available too, but unfortunately only if you use iCloud to sync your calendars. In terms of integration, Calendar is not big on integrating its API in other apps. It does however cover all popular calendar apps out there, from Google to Yahoo and Microsoft Exchange. If your whole office is already committed to the Google world, thinking of using Google Calendar would be a wise move. Many consider Google Calendar to be the best shared calendar app around. 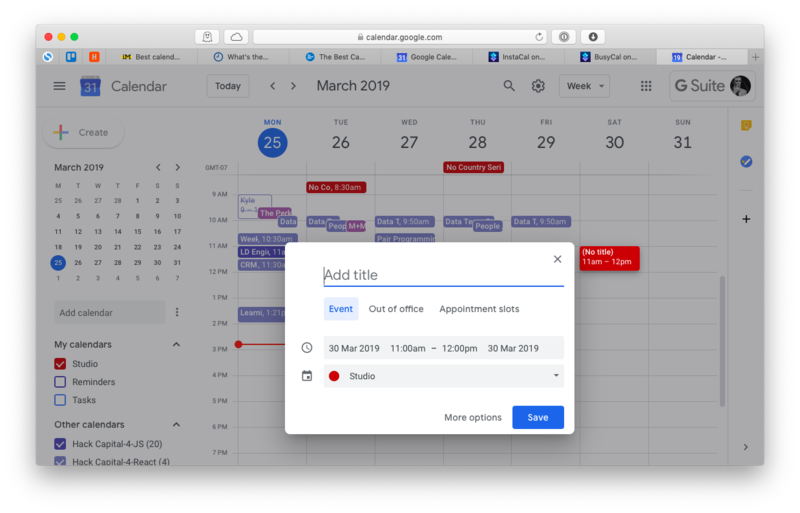 While boasting clear and beautiful interface, the app makes adding other people’s (or even room’s) calendars just as easy as yours, especially if they are on the same Google corporate account. Additionally, all your events are created with an automatic Hangouts link for video calls. Working in Google Calendar app means benefitting from its connection with all other Google services. Events from Gmail would automatically be added to your calendar and Google-powered auto-suggestions are truly powerful. Fast and reliable (when was the last time Google servers went down? ), Google also offers native apps for Android and iOS. Sadly, Google Calendar desktop app Mac is not available at this time — only the web version, which can be accessed via any browser. Google Calendar app for Mac is frequently integrated with other services, much more so than the default Apple option. And just like the Apple calendar, it’s a worthy contender to be the best free calendar app for Mac. When you days are frantic and ease of access becomes top priority, InstaCal is a worthy alternative that lives right in your menu bar. InstaCal is hard to beat on usability. Click on its menu bar icon and it will show you all your tasks for the month in both calendar and list views. From here, you can easily edit or create appointments, as well as add new attendees. Simple reminders can be managed here too — something that differentiates InstaCal from competitors. While InstaCal doesn’t support any unusual features, it’s as fast as an app can be due to it being preloaded in the background at all times. 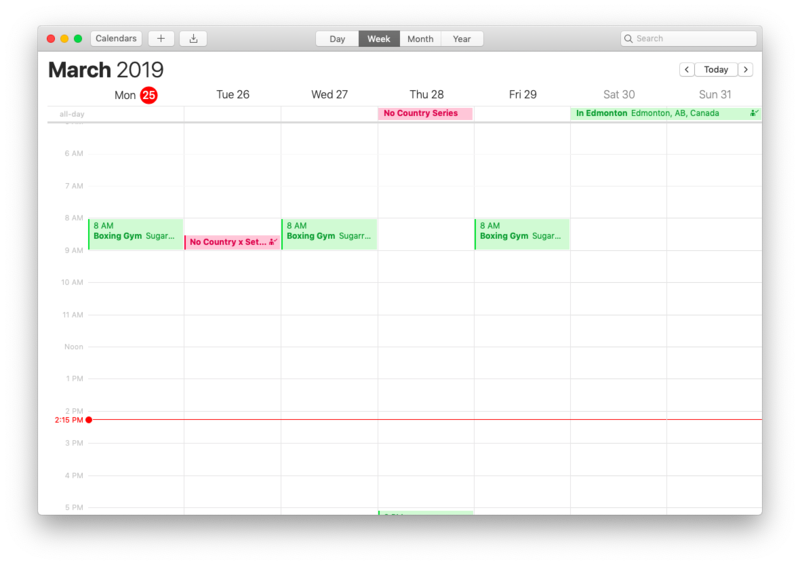 A Mac calendar app first, InstaCal doesn’t have mobile or web versions available, but it syncs perfectly with iCloud, Google, and Microsoft calendars. InstaCal is the ideal example of an app that’s been optimized to the limit for speed and convenience. No fluff. Looking for the most feature-packed Mac calendar app around is likely to lead you to BusyCal. From being present in your menu bar to incorporating to-dos to even showing you the moon calendar, BusyCal has every feature you’d ever expect from your calendar. 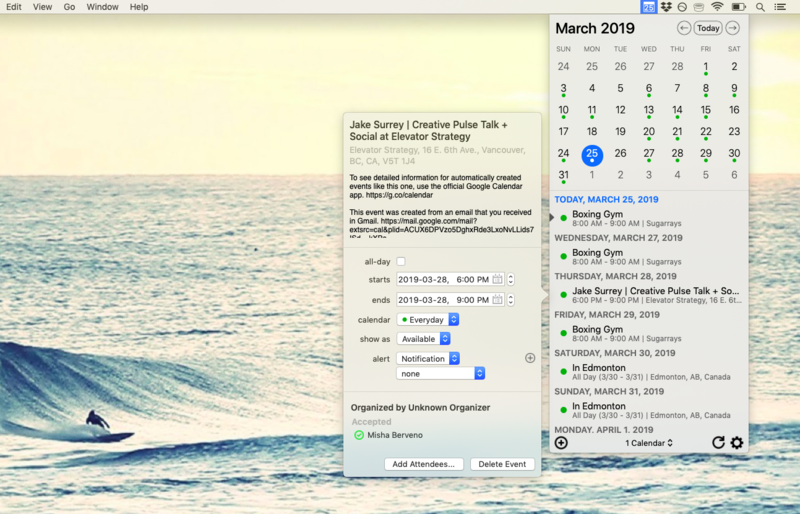 In terms of design, BusyCal looks and feels like a mix between a pumped up default Mac calendar app and InstaCal (due to the menu bar extension). You can create a quick event using natural language by simply clicking on the plus icon in the top bar. To save a new to-do, right-click on the To Do panel on the right and choose New To Do. Built as a native app for macOS, BusyCal feels quick and nimble. In addition, a full-featured iOS app is also available. Both versions are highly popular among heavy Mac users and thus integrate well with lots of other applications. Which Mac calendar app is right for you? Discussed above are four of the best calendar apps out there. In the end, it all comes down to what you value the most. If you’re looking for the best free calendar app for Mac, the default Apple option or the one from Google could be your choice. However, compared to the other two competitors, they lack functionality and convenience. InstaCal is by far the fastest and the most at-hand Mac calendar app. It doesn’t distract you from your work when you need to quickly check the next meeting or correct a few details. Sometimes you might even feel you have a personal assistant right beside you. 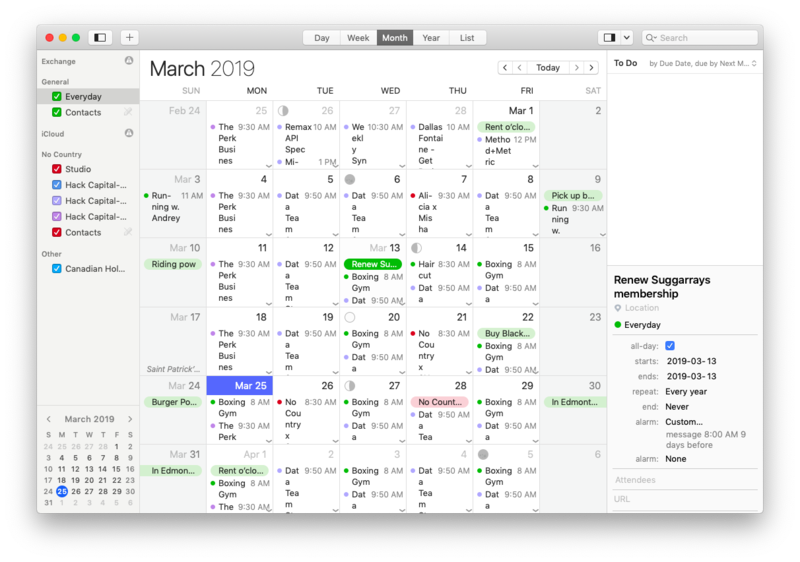 BusyCal takes the default Mac Calendar app as its foundation and improves it on nearly every dimension. Use to-do lists, get more context around the weather, briefly peek at what’s going on in the menu bar, and much more. Best of all, both InstaCal and BusyCal are available for a free trial through Setapp, a platform of over 130 Mac apps and tools created to streamline your work processes, from task management to web development. Let’s see what you have scheduled for today.